Former Jehovah’s Witnesses and Bible Students testify about providential experiences from Jehovah which drew them to consecrate (symbolized by baptism) and to accept the Truth. The moderator interviewing the brethren is Bro. Irving Foss. You can read his “eye witness” testimony on the Testimony page, where he describes how the Chicago Bible Students broke away from the Watchtower in 1933. 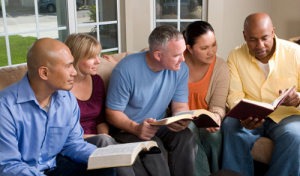 Personal Testimony meetings were always normal part of Bible Student services in the days of the early Watchtower. Bible Students have continued this practice to this day and we receive many rich blessings from hearing the weekly experiences our brethren go through, encouraging each other and seeing how the Lord is directing our experiences to help us grow in character as New Creatures, to be more like Christ and to develop the Fruits of the Spirit (Gal 5:22, 23). Some of those testifying became Bible Students in the days of the Early Watchtower when Pastor Russell was alive. You can listen to this interesting testimony meeting from a Bible student convention in the 1960’s by clicking on the link below. November 19th, 2010 | 60 comments - be the next! I’m a former jw of 40years(not Dfed) & have testified a few times on this site. Its been 3 years since i attended a jw meeting.I am amazed at the various different JW’s sending me very…what i refer to as…..religiously terrorizing messages. I have lost 99% of my friends, my own father, even a wife. I’m in constant contact with Br.Peter from here, connect with Sr. Jacqueline also, I monthly keep in contact with a 90 year old Bible Student Sister….such a comfort & blessing to talk to….Am in contact with another Bible Student elder & his wife who have been so giving of their time….also send cards to various BS’s who are suffering with medical problems & they send me back scriptural cards as well to encourage me. I’ve attended several BS meetings & Conventions even Family days they host. At present I’m mostly confined to online research to learn the truth from the BS web sites at home & my own Bible Reading study. I’m grateful that the Lord led me to the BS Truth Movement of whom led me to scriptures helping me to relearn 40years of confusion within JW. I’m even grateful that the Bible Students don’t send me hate messages like my old JW friends & family. Sometimes I copy a pic of the jw hate messages & a BS Elder will say a prayer for me….so kind…such a loving expression. I live in Fear here. The jw here are vicious to me. Even getting me fired from my jw customers as I’m self employed. They tried to lie to a judge to get my kids taken from me 4 years after i divorced. A Bible Student Elder who’s an attorney guided me to hire an attorney here & God helped me not lose my joint custody. The JW’s were even trying to get me to lose full religious control of my kids by having me sign a document that my ex wife can pick up my kids from me on my two weeks a month & they must go to my ex’s kingdom hall. The slander & defamation of character only identify to me the JW’s cannot have the Truth.All my old timer beautiful JW friends have each passed away one by one leaving behind ppl that i cannot consider my brother or sister. I”m grateful to my BS friends scattered all over that are sensitive in their dealings with me. I am an abused & wounded sheep.Not everyone knows how to help someone who’s escaped an abusive environment. I’m so grateful to the ones in the Bible Students who know how to help me the most. The Scriptural discussions i have with a BS vs JW are like day vs night. I’m now learning at a whole new level. The grip of fear on me is lessoning these 3 years i exited. Jw elders continually won’t leave me alone & question where i attend…I now refer to the Constitution which gives me the legal right to privacy & freedom of religion. I will not talk to them on phone. I only allow text messages so i can prove any abuse on a paper trail. I suffer with Flashbacks. So I’m very careful with myself & worship within my limitations…but i have never stopped worshipping Jehovah God daily. My prayers are answered. I feel the everlasting arms of Heavenly Father always despite JW’s saying nothing exists outside their realm..
It’s been a while since you posted here, hasn’t it? I really appreciated your expressions in this message. What you said about religiously terrorizing messages matches much of my experience. It seems to me that terror and shame are THE control mechanisms of JW choice. I finally came to recognize the JW prescription for imposing (dominating) “law and order” was identical to the methods and objectives that brought about the Inquisition. “NO! That’s not true!” JW’s argue. Ok, so they don’t engage in waterboarding, and they don’t use the Iron Maidens. But everything else is just whitewashed methods and means with the same ultimate objectives of psychological manipulation (aka terror tactics) as the Inquisition had. As Brandon (Lee) said in another message, these men only have as much as power as we give them. I’m glad to hear that you’re no longer giving them any power. I’m really glad to hear you have Peter and other Bible Students to associate with. At the same time, I’m also really sad to hear how much you’ve been through. I am ever so confident that every tear you’ve ever cried–and even the one’s you didn’t or couldn’t have been precious to, and not gone unnoticed to God and Jesus. It’s really hard sometimes, not to meet hate with hate. Especially for those of us who have been traumatized, abused, and broken. I agree with your sentiments when you mention how the Bible Students are so very healing, refreshing, encouraging, loving–in other words, TRULY Christ-like. If not for the Bible Students and their genuine love, their tangible expressions of loving-kindness and sensitivity, we would probably have a very difficult time even appreciating the expression “Christ-like.” If the only version of “Christ-like” I ever came to know was the JW version, I’d avoid Christ like nothing else. Anyway, thank you again, Dundee, for expressing yourself here. I send you greetings, caring, hugs, and encouragement. I am keeping you, and all the others like you–both the ones I know of, along with the countless others who maybe have never expressed themselves here but of whom I can still imagine–in my prayers always. Hi Dundee. I would like to connect with you personally to share experiences and encouragement. My email address is tedrat46@hotmail.com. Like you I have to be careful. Thank you…I’ve sent you an email so we can correspond. To those of us leaving the organization I would like to encourage you to remain positive. We have found the real truth. Never would we want to return evil for evil by slandering those we have left behind. While we may have legitimate reasons for being embittered, let’s not let that bitterness cause us to bring false accusations or slanted statements of half truth. Keep our statements fair and honest. Keep positive and place the unpleasantness behind us. Concentrate on the truth our lord has revealed to us. Doing so we take away the ammunition of the society that apostates slander “Gods servants”. Christ tells us to love those who persecute us. When tempted to make an embittered statement ask yourself, would Jesus say this about his persecutors? Is it true? I’m not saying that certain false teachings or wrong actions shouldn’t be exposed or minimized. But we need to make sure we always speak truth and give honor to our God and his beloved son. Ted R, so glad you enjoyed the study. I know how blessed you feel. I was overcome with finding our brothers again. I heard from Henry about your testimony and the others. I am here for the Funeral and praying for peace. It will be on my part as I am here to support my grieving family. My family has 2 elders and one of my son’s that try to make it difficult for me at family gatherings but so far other family are resisting them causing me mental anguish. I am who is needed in this instance to help my sister. I pray this will turn into a blessing for all of us. I hope to be back on the study next week. Take Care my brother and welcome. Also I will forward the Sunday info to you along with the weekly email to all. Sister Jacqueline I am so sorry you have experienced loss. It is comforting to know that our loved ones will return in the resurrection, but this does not take away our grief. I read your testimony on the web site. You are truly a strong woman to go through such experiences. I enjoy reading your comments here on the site as well. I have been in touch with Andre Ricardo and we are going to schedule a Skype conversation. I look forward to it. I need the contact with brothers. I am hoping the brother in Akron contacts me soon, I do not have his phone number and would like to arrange to attend their memorial service if they have one collectively. I know most of their meetings are done via phone. If I don’t hear soon I will contact Peter and see if he can help. If I seem quiet during the Wednesday meetings it is because right now I am attending covertly in my bedroom. I can’t talk too loudly or my wife may start asking questions and I am not ready to let her know what I am doing yet. I need to approach this gradually with her. She has raised in a strict JW environment. She also talks a lot with our daughter who is married to an elder. Both have a tendency to be critical and condemnatory. Hope you understand. Look forward to the meetings and thanks for the encouragement. Yes I do understand. Most of my family are witnesses, in fact I can’t name one here of 50 that aren’t. Even as I am typing there are witnesses all around but they are followers of Christ individually. They love me and I them. Our parents and their parents taught us to respect our older relatives so that is a protection for me. They are not persuaded by the men in Warwick to hurt their older Aunt. The Memorial service is the test as the elders will be there and I have not kept my decision a secret. I really never knew the shunning policies as I migrated over from Bible student to witnesses. Some here during my childhood actually knew brother Russell and all knew Rutherford. I grew up under Knorr. You made decisions for your households at that time. The society only printed books and had no say so in the congregation until segregation was over in the late sixties in the South. So far this has been a blessing. I am the hairdresser and Therapist so they indicated they wanted me to come early. I am also along with a sister in law the older matriarch of the entire clan so things won’t get to crazy. My son’s and nephews and nieces will jump into action. Your first convention will bring you to tears as the layers of misinformation melt away. I can’t believe God included me with the rest to come out of darkness and worship of men in place of Christ. Take Care and pray for your household to retain peace. A wife likes to be protected so I appreciate that expression. We are different and will follow our husbands if they recognize the emotional aspect of our very fiber. You have done that and don’t forget it at any time and she will speak of you in the Big House. Also the reprints (Zions Watch Tower) in their original form won’t paste on here but I can send them in an email. I would love that. Can you help us out Sister Jacqueline? Feel free to provide my email as well. Yes do you have a set of Studies in the Scriptures? Give me a call. I’d like to send you the Studies books as well. You can call me. 904-316-9587 or text. Whichever is best for you. Hello everyone. I just finished the memorial at the kingdom hall in Birmingham for my sister’s husband. It was a blessing! All of the family showed up. The elder that gave the talk was a friend and actually brought healing to our family with his words. He mentioned how our family will stick together against anyone if one is threatened. I think it struck a chord with us all because we are over 200 strong and our mother had one of the first congregations in her home. I decided to speak to all the elders in my family that were there and not speaking to me after the talk. All spoke back. I put my arms around them as I spoke. I spoke to the wives also and they said hello and one that was always dear to me ask how I was doing. It is a start to heal the rift among siblings brought about simply because I was called to Christ and could no longer substitute the governing body in his place. Nothing else happened in our family to cause a problem. The way the brother gave the talk was healing. So blessings can come from any source of believers in Christ. He mentioned the Ransom and Christ often. Now I am with family for the remainder of the evening. I’m happy for you Sister Jacqueline. Your faith and endurance is truly a fine example for all of us. May Jehovah continue to bless you. Ted R thanks. I can’t tell you of one negative experience. I think some of my family were confused about the freedom of religion rights that the society won in Canada and here in the United States. That guanrantees every person the freedom without persecution to worship God freely. To be guilty of persecuting Christians is grievous. Over 100,000 Christians were killed last year one xm station reported and the news never carried it because it is focused on Trump. Mostly Muslim nations did this. To be classified among these haters of Christ by persecuting Christians that have chosen to leave Jehovah witnesses is just as bad. For shunners to stand in God’s place and pass judgement on individual Christians is presumptuous. Hopefully the governing body will change their policies seeing that Russia is coming down hard on them for breaking up families in that country with shunning. My family has always been close and supportive of each other as the brother stated in the funeral talk. I think everyone heard and listened with their heart. I thank Jehovah for this test of faith and a step toward reconciling. BTW. MY SON AND I RECONCILED. We took pictures together and with my other son and talked about what’s going on in each other’s life over this seven year period. For everyone going through this, persevere. It can not only be a trial but also a test of your loyalty . The Church must be loyal to be able to work with Christ during the Millennium. Jesus learned obedience from the things he suffered. The congregation came thru in a big way and sisters worked with me in getting flowers to car and all are aware I am with the Bible student brothers. Thankyou Jacqueline, for your update on your new refining experience. I didn’t know about the persecution of Christians was that high in Muslim countries. Another problem in Russia is Page 130 in the book “What does the Bible Really Teach?” which has been banned. Also, the JW.org website, because is contains that same information in booklet form. Since once a former Soviet Union was successful in forcing the CCJW into NOT making the taking of blood a disfellowshiping offense (Romaina) the other countries know they can now do the same. Since now CCJW are bapisting children as young as two years old, and making them accountable to the CCJW, as well teaching the idea that a “mature adult under age” can make life changing decisions, they are guilty of undo influence in the eyes of various governments. When anyone attempts to persuade another with 1/2 truths when they are entitled to the whole truth they have infringed on their basic human rights. This is why our wonderful God Jehovah has given us the bible for us to be like the Bereans and check everything out BEFORE making life changing decisions. It takes a considerable time and true maturity to weed through all of the religious sugjestions that are thrown at a younger adult to recognize the precious truth of Gods plan for “RESTITUTION OF ALL THINGS” At the assemblies last year a youth under age was praised because he lost his life by refusal of blood. This is what Russia does like, UNDO INFLUENCE. Refusal of life threatening efforts is considered radical thinking. The rank and file JW dosn’t even realize what the persecution in Russia is realy all about. You are correct, many aren’t aware that the undo influence and shunning that is breaking up the families is what Russia is using as the reason. It should be a false charge,o but it is a true charge and as a government they should act. The society rewrote the Canadian Constitution with legal action to institute these very laws of freedom. That is why I come out strong against the governing body and the institution. The individual witnesses are like us trying to do what we can see God says. I was not aware that they immerse 2 year olds. Wow! I posted the letter once of informed consent of your children. The letter ask parents to reach their children how to convinceI authorities that they are adult acting and can decide to refuse blood and commit suicide. I wonder about these men killing children and praising this before crowds. It reminds me of the Canaanites and why Jehovah had them wiped out because of sacrifice of children and virgin girls saying he required it. I always told my husband I couldn’t let our children die if it came to blood transfusion because of how Jehovah stopped Abraham. I am not one to push newly reformed relationships. I will still respect their space because I understand how difficult change can be when they fear death at Armageddon. God is just not a mean God. I wish they could present him more as a delivered of fallen man rather than a vindictive God. Please forgive me. It was a ten year old not two years. My hearing isn’t that good these days. I was baptized at 13 years old, and it wasn’t till 32 years of age I realized something was wrong with the policies of WTBS, but I hung in there thinking, some else besides me must have noticed it too, as well as thinking “well the Christian walk is a difficult walk”. Then when the internet filled in information that I would not have gotten on my own I lost all heart for the fight. Now that Jesus is in the battle with me I find each day gets sweeter and sweeter. My brother was baptized at 9 while living with an uncle and my father and mother almost died. Infant baptism is a Catholic practice and they pattern themselves after that organization. I knew something was wrong when I got in my twenties but was busy raising a family with my husband being an elder I missed that a governing body was forming. I didn’t really understand until the 2000 I immediately rebelled and the elders fought back. I was locked in battle with these people for 9 years. It was very vocal and fierce. Everyone knew I didn’t accept the GB and I insisted Israel was still Jehovah witnesses. Their being an organization says if one isn’t saying they are a witness they don’t go after them. So while a bunch of people screamed for them to DF me even now. Their own laws prevents them from doing so.Also the restraining order prevents them from retaliating to cause me emotional harm for the remainder of my life. They don’t issue those anymore. Ted R. Just ride out the storm when it comes. Shunning began in 2008 so this is 2017. Our Brothers the Bible students stood behind me and kept me thru horrible illnesses and the shunning. So friends beside you can be the calm amidst the storm. Yours may be different and something may have happened to open your family’s eyes. So don’t worry, Jesus said if he went home only then could his father send the helper. I am a Bible Student/JW. I say that because while I am still going to the JW meetings, my heart is now with the real truth. I became a JW in 1970 at the age of 16. My parents were strongly opposed. A JW sister had been calling on our home for years and one day invited me to a meeting. I went and new that it was the closest thing to the Truth that I had found. I could not agree with Christendoms view of hell fire or that Christians should kill one another in war. But through the years my faith has been shaken. All these basically good people were going to die because they weren’t JW’s???? Disfellowshipping and cutting off all communication with a brother and/or family member for smoking???? These didn’t make sense. I kept going because it was the closest thing to the Truth and I figured that Jehovah would settle matters in his due time. At our recent book study we were discussing the history of JW’s so I started doing research and came upon the Bible Students websites. The more I investigated the more I wanted to learn so I requested information from a couple different sites including this one. Peter contacted me and put me in touch with some Bible Students in Chicago, Columbus and Akron Ohio. I have been studying on my own and will be attending my first in person BS meeting in Columbus this weekend. I have found the real TRUTH! I have to continue going to meetings with JW’s because my wife has some severe emotional problems so I can’t risk getting disfellowshipped at this point. It would mean causing her too much anxiety and she could relapse into more serious depression. So at this time I am torn. I get no real enjoyment out of attending the JW meetings. Whenever I can I go to my office and attend meetings on the internet instead of going to the Kingdom Hall. I attend the Tuesday meeting online with Chicago BS and Wednesday with the friends on this site. I am trying to work out a way to attend the General Convention in Pennsylvania. When I was baptized in 1970, my dedication was to do the will of Jehovah and Jesus. I was not dedicating myself to follow an organization and had I realized the control that the organization imposes, I would never have followed this course. I feel trapped but I rely on Jesus and Jehovah to help me. Thank you for this wonderful website. Jehovah and Jesus continue to bless your efforts. It always amazes me how similar to my own experience are the experiences of others with respects to the development of deeply serious doubts about the JW organization. I want to thank you sincerely for sharing your expressions here. I find it very comforting to hear that I’m not alone. I’m sure others do too. Thanks! Also, please be assured that you are not alone in your current situation in finding yourself having to keep one foot in JW-land. I’m confident that (even though it’s hard on you) your patient sensitivity to your wife’s needs will provide her the support she needs to (eventually) make the transition. I’m also confident that God and Christ will continue to bless your prayerful determination and (eventually) make the way clear for you. Please feel free to continue to ask for encouragement and support here, because there are many others who find themselves in very similar circumstances. Thank you for sharing, this is very encouraging to me and I am sure many others. I have not been to a meeting a bit over a month and after my last talk with elders and after how my wife was treated I will never again step foot in one. At first I had to keep attending some meetings because of my job but we are ready to have to find something new soon as my job is in jeopardy because of me no longer being active and at the hall so I can can relate to one thing I am thinking and that is being at the hall when likely that is the last place you want to be and hearing so much that you want to speak up about yet cannot. It takes a toll… I have been slower to getting myself grounded spiritually it seems than you have been, so again thanks for sharing. I need the boost. I pray for your wisdom & that how you associate now with the Truth Movement among Bible Students will have the least impact on your wife’s health. That is a tough situation. Personally i had faded without getting Dfed. Sister Jacqueline showed me how. It was getting very intense with the elders & I was in a state of fear. For your wife to deal with it happening to you would be much more intense so i appreciate how you are doing it online & trying to figure out how. My situation is different. My wife cheated, turned the entire congregations against me, a judge kicked her out. I only deal with me & my extended family that live in my home. But the jw have stalked me, & not paranoia….i have felt they have watched me or could of been following me. Its taken a lot of assertiveness to get them to leave me alone. Recently they’ve gotten me fired from jw job sites…i’m self employed….they always try to hurt my family. So again I pray for your wisdom. That is what a dear Bible Student Elders wife here in my locale always says……Brother…….I will pray to the Lord on your behalf for the wisdom needed in your particular circumstance….Can’t say it any better than that. Dundee they do stalk. Our security confronted an elder that had office workers afraid because he was crouched down in his car watching my doctors entrance to my practice. Security footage revealed he was stalking at other times also. He sped off when confronted. So I believe you and you should be very careful. Oregon has some instances of extreme physical violence and murder among the witnesses there. Satan likes thus type of fear and confusion. Legal action is the only way I stopped them but one elder still stops by once a year. The new letter says not people like us tho. No visits anymore. Hopefully they will allow freedom of religion. Be safe, you case is unique with the wife and boyfriend thing. Hello and thank you for sharing. 2017 ari Matthew Davies I’m still with Jehovah and my hair is grey but my heart is renewed daily oh yuck on this old system how I look forward to Jesus. Hello Ari, nice to hear from you. My hair is white also and I am glad to be alive and loved by God! Did you hear about the new planets they found. Wow! God has so much more in store for us. There are worlds to see. I am excited and glad I know more about how good God is and am free from following men. I feel strong that I should vote but need to take less involvement in world of politics, bible students advise I need, Jehovahs witnesses will shun members for being in politics why do they do this,. If I understand your question correctly, you’d like to know why JW’s shun members for involvement in political affairs? Did I hear your question clearly? It’s actually a two-part question. The first part of the answer is: they shun others because they are led to believe that is how you shame a person, and that shaming is not only scriptural, but demanded by God, and that shaming a person is the best way to pressure that person into changing. So why do they take this drastic action with someone over political involvement? Because they also believe that any (and almost ALL) involvement in political affairs would be equivalent to choosing Man-Rule over God-rule. Hi Kevin, let me give my opinion. I have not read any other answers yet. I voted for the very first time this year and am I glad I went down to the place. On that ballot was something HUGE that affected me directly. We were never told that there is more than presidential elections etc on the voting ballots. I live in an area where they needed everyone to vote on whether the taxes should be raised to support schools. It would affect my area the most because we support the city of Gary with property taxes. The community won a supreme court ruling to refund us thousands of dollars for over taxation, I voted NO. There was a number of community things I really needed to vote on on those ballots. The witnesses never told us any of this. Hello ari davies, nice to hear from you. We hope all is well with you and thanks for the encouragement. In a way most of us on this site are new to Christ as I for one never knew or appreciated him the way I see him now.